The authors, Placher and Willis-Watkins, are two members of the committee that prepared "A Brief Statement of Faith." This section-by-section, line-by-line commentary reflects on the meaning of the statement, its relevance for today and gives an excellent introduction to Reformed theology. It will help Presbyterians think about who they are and what they believe, and will help others concerned about the relation of the Christian tradition and contemporary issues. This section-by-section, line-by-line commentary reflects on the meaning of "A Brief Statement of Faith" and its relevance for today. It will help Presbyterians think about who they are and what they believe, and will interest others concerned with the relationship between the Christian tradition and contemporary issues. William C. Placher was Charles D. and Elizabeth S. LaFollette Distinguished Professor in the Humanities and Chair of the Department of Philosophy and Religion at Wabash College in Crawfordsville, Indiana. He was the author or editor of a number of books including A History of Christian Theology, Jesus the Savior, and Essentials of Christian Theology, all published by WJK. David Willis-Watkins is Charles Hodge Professor Emeritus of Systematic Theology at Princeton Theological Seminary in Princeton, New Jersey. He is the author of Daring Prayer, and editor (with Alexander J. McKelway) of The Context of Contemporary Theology: Essays in Honor of Paul Lehmann. 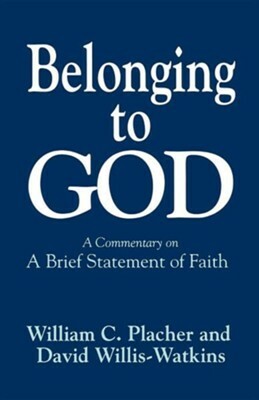 I'm the author/artist and I want to review Belonging to God: A Commentary on A Brief Statement of Faith.